Today Kontron, a leading global provider of IoT/Embedded Computing Technology (ECT), announced the new VX305H-40G 3U OpenVPX single board computer module. It continues to build on its successful VX305x SBCs and the I/O intensive VX305C-40G, which began shipping in December 2018. The VX305H-40G brings high-performance Xeon-D based computing and 40/10 Gigabit Ethernet networking in a package that is both developed in alignment with the SOSA(TM) technical standard and is compatible with the US Army’s CMOSS definition. Kontron continues its tradition of offering high-performance open systems architecture (OSA) computing products with their new VX305H-40G 3U OpenVPX single board computer (SBC). 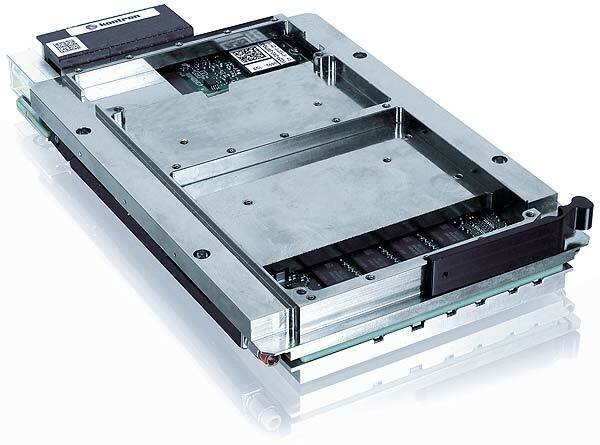 Designed to the VITA 65 slot profile SLT3-PAY-1F1F2U1TU1T1U1T-14.2.16 (known as the “Compute Intensive SBC profile”) chosen for inclusion in the SOSA(TM) technical standard, the VX305H-40G combines the computational power of the 12-core Intel® Xeon® D-1559 processor with multiple high-performance data pipes, including a 40 Gigabit Ethernet (GbE) Data Plane, a second 10 GbE Data Plane, a 10 GbE control plane, and a wide, 8-lane PCI Express Gen 3 Expansion plane port. This combination in an OSA platform makes it an ideal choice when designing a high-performance sensor system using modular open systems architecture principals. The Kontron VX305H-40G leverages the Intel® Xeon® D-1559 processor, which provides best-in-class computation performance for demanding signal and image processing applications. The VX305H-40G combines that with a 40 GigaGbE Data Plane, a second 10 GbE Data Plane, a 10 GbE Control Plane, and a wide, four-lane PCI Express (PCIe) 3.0 expansion plane to the backplane for system I/O. It also offers an XMC site to easily add front-panel I/O or bulk data storage. The result is a versatile 3U SBC platform designed to fit in any SOSA(TM) or CMOSS payload profile slot with a ruggedized package for harsh size, weight, power, and cost constrained environments (SWaP-C).